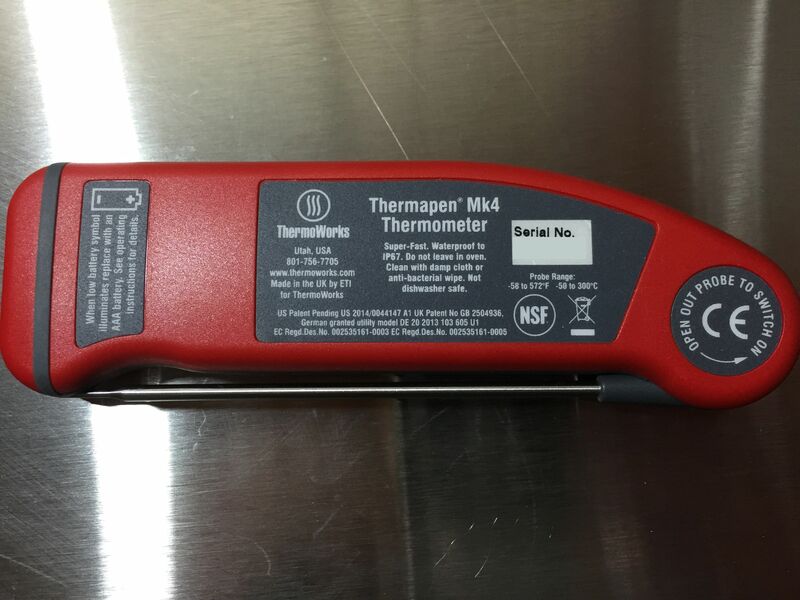 Here’s a look at Thermoworks new Thermapen Mk4 (Mark 4). 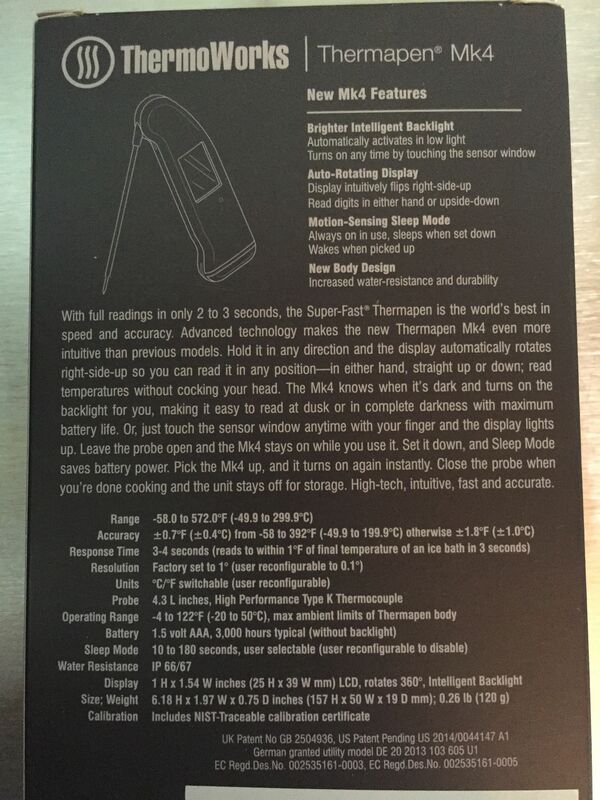 The new Thermapen boasts a number of great improvements and features including – auto rotating display, auto off with intelligent sleep and wake modes, intelligent backlight -standard, 3,000 hour battery life (now uses easy to find AAA batteries! ), 3 second read times, accuracy to +- .7 deg F and… Waterproof! to IP66/67 standard. Thew new Mk4 features intelligent backlighting. 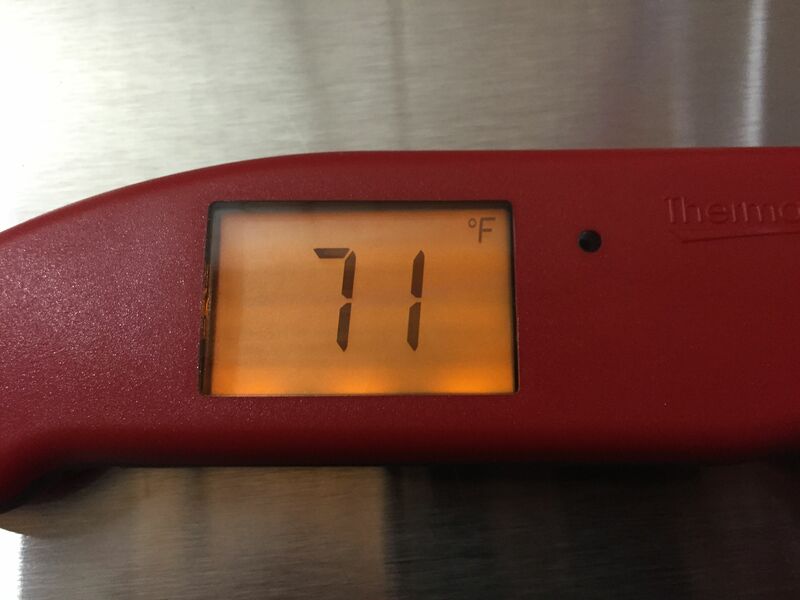 A version of backlighting was available on the previous Thermapen. It was an additional cost. Intelligent backlighting is now standard in every Mk4. Back of the thermometer. Note the Serial Number has been removed from this photo. The Mk4 has some additional heft. Here it is on my American Weigh Gram Scale. The previous version weighed 94.63 grams. The Mk4 comes in at 111.42 grams. About 17 grams heavier. My guess is that AAA batteries make up most of that difference. 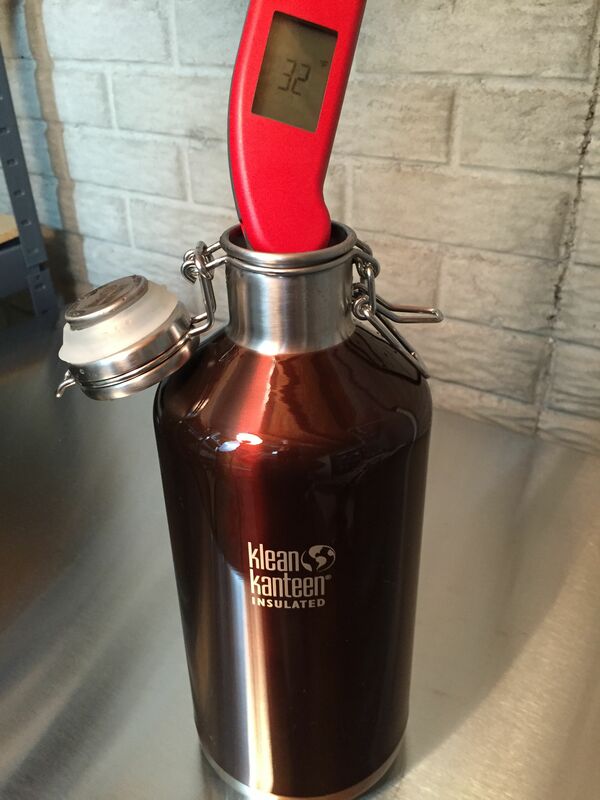 Here’s the Mk4 in an ice water bath in my newer Klean Kanteen Vacuum Insulated Growler. This shows a couple things – First, it is reading 32 deg F. Yay! Second, you can see the rotating display in action. My favorite feature of the new Mk4… it is waterproof to the IP66/67 standard. This is me running water on it in my utility sink. You wouldn’t have caught me doing that with the previous version. Update: After using this thermometer for years, I can highly recommend it to you. Thermoworks makes great gear and the Mk4 has lived up to expectations. 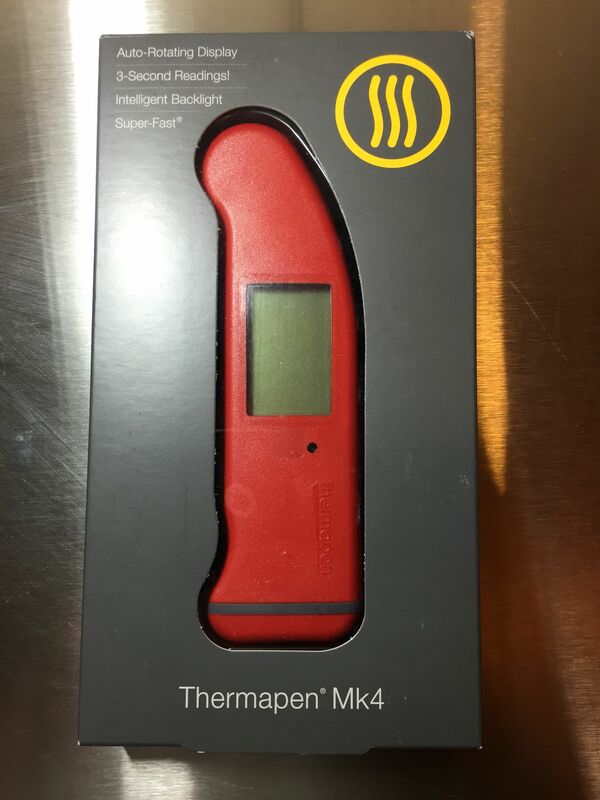 Looking for a deal on the Thermapen Mk4? Save an Additional 10% on ThermoWorks Purchases! 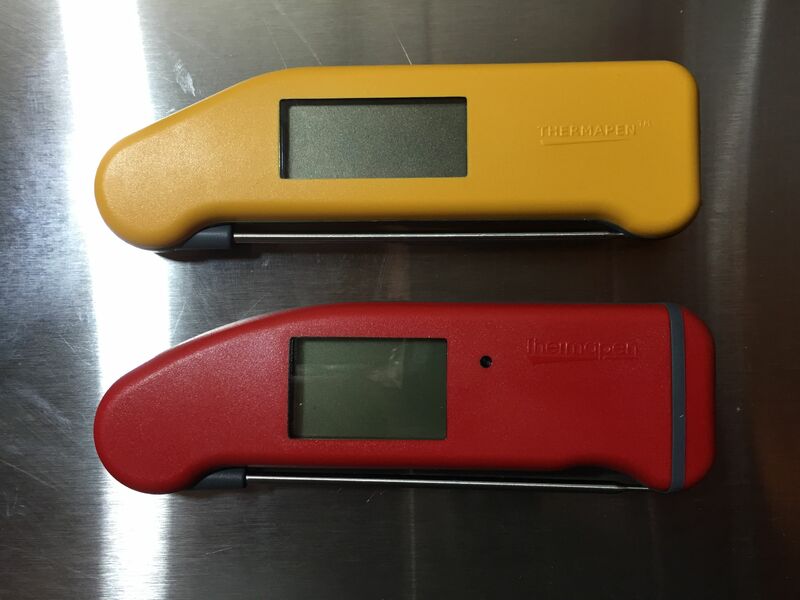 Also: ThermoWorks & Thermapen – Deals, Discounts and Coupons! 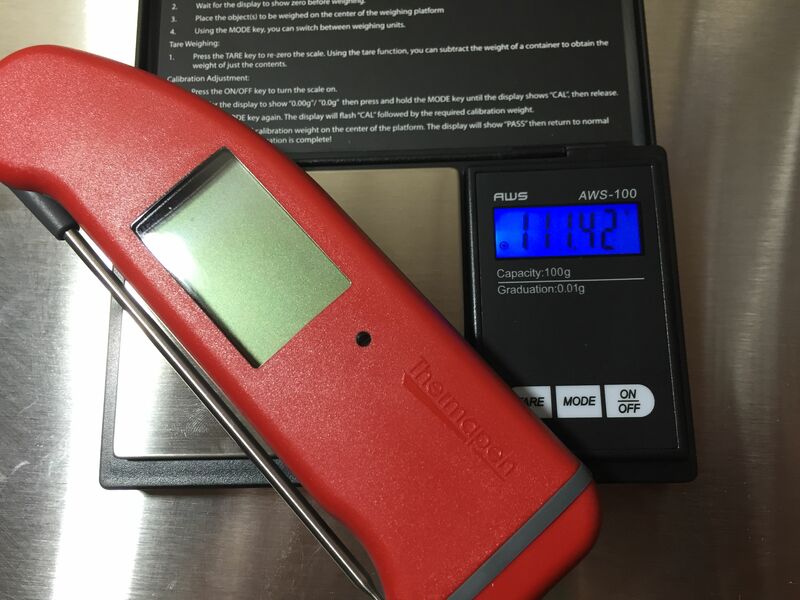 Thank you to ThermoWorks for providing me with a pre-release Thermapen Mk4 for this First Looks post an an eventual full review. 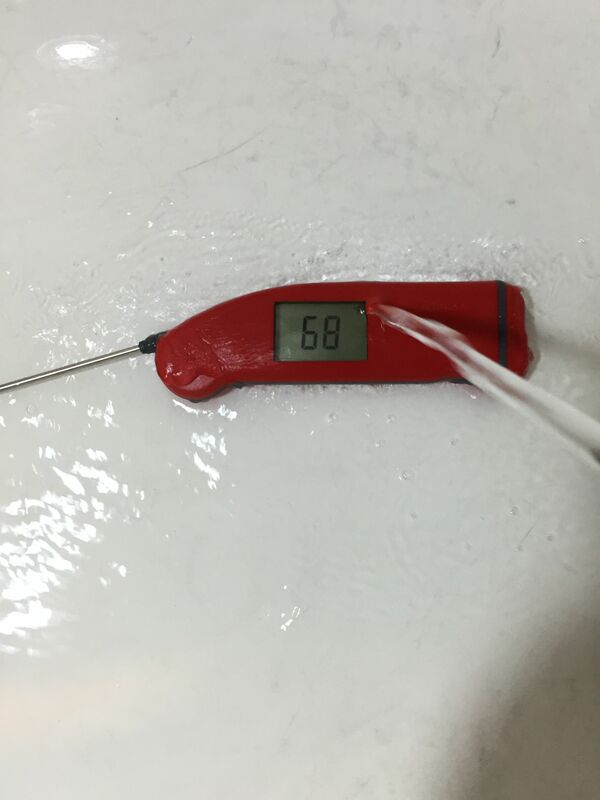 This entry was posted in Featured Reviews, HBF Tested, Reviews & Top Posts, Thermometers, ThermoWorks on September 3, 2015 by admin. Do you ever do giveaways of the products you endorse like other bloggers will do on their websites? Show your supports some love. Hey Jason! I do do giveaways. Stay tuned, I actually have something coming up from Thermoworks (it’s not and Mk4 though). Cheers!